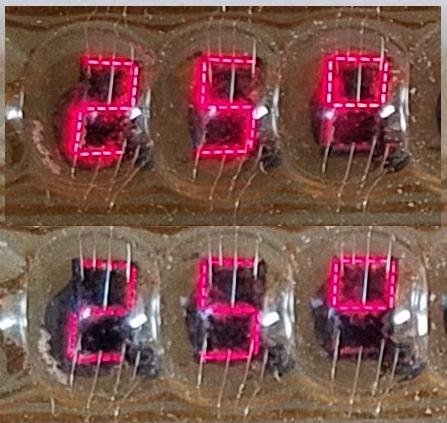 For one of my 'fun' project I needed a display for which 7 segment displays are sufficient... but it needs 'a lot of' them in a tight space... and that's where the Bubble Displays come in: Retro, small red LED segments behind a lens to make them readable. Surfing for supplies I found individuals, bars of 4, 8, and 12... The most affordable - and convenient to use ones - are the PCB carrier bonded ones - see attached photo. The display can be looked as a matrix of 8 columns (segments) and 12 row (digits) of (144) LEDs (with the columns of one row lit at a time / all rows displayed time multiplexed). The Anodes defining a columns of a matrix, and the cathodes are the row... Something like that is easy to drive with shift registers, as we see in other conversations, such as Driving LED matrix with shift registers such as 74HC595 and Is it possible to connect this 8x8 RGB matrix to espruino boards?. The project of this conversation was first, but got 'intercepted' by previous ones before being published. But now is the time, and it turned out even enhanced with the input from the other conversations. Segments A..H that have to lighten up by being driven high, and because all same segments are connected with each other, the common cathode for only one digit can be low at times. Therefore, the display has to be driven time multiplexed: one digit after the other has to be displayed in a fast manner, so that the human eye still perceives them as lit at all times... The previously mentioned conversations elaborate in more detail about why all digits are displayed - one right after the other in one 'shot' - in intervals of 10..20ms. 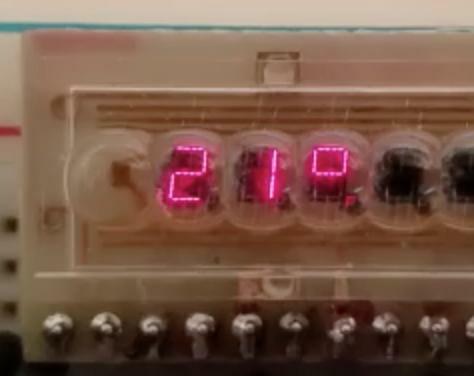 Interesting is that a the bars of one digit are on just for the code execution time for prepping to light up the next one... the delay is not between the display of the digits, but between the lightening of all. Of course, this gives a lower duty cycle - and dimmer display - but proofs to be less susceptive to flickering when something else is going on and the interval cannot be honored in a timely manner (the whole display gets dimmer instead of one digit becoming brighter, which is choosing the lesser 'evil' / shortcoming). 1 for driving (sourcing, 3.3V, 5V) the 'common' (segment) anodes. We have 4 bits left that we can use for something else. The 3 595s are cascaded, the way that first the digit high-byte has to be feed first to sink one of the digits 5..12 (counted from the left) is shifted in with MSB first, and then the digit low-byte for the digits 1..4 (counted from the left). As last byte the segment byte is shifted in w/ MSB (segment H, decimal point) first. In the picture, the cascading is from the right to the left (the 595 are upside down (top left pins on picture are pins no 7, GND). This way I could use the same wiring as described in the previous conversation. I had just to relocate the Espruino-WiFi to the other side of the board. In the picture, only the first 3 digits are wired up... (cheap excuse - literally cheap: I ran out of resistors with same value in needed range in my stash of scavenged/salvaged components...) ...but it proofs the circuitry and code. with digit 9..12 and 4 extra information bits. // A0 dnss is co-used for output register latch. //    Latch prevents blur while shifting. // A1 can do PWM when danger of over powering LEDs. In scan details pictures below you can see some 'bleeding' - 0ff-segments that are very dimly lit. Bleeding can only be reduced by different scan logic: disable output while shifting data in. Unfortunately, this lowers the duty cycle even more and the display gets even dimmer (barely readable in ambient light - as you see by the lighter picture - longer shutter time). Scan time has already been increased from (theoretically) 100 to 125 times per second (every 10ms increased to every 8ms). ...may the bleeding come from shutter time / camera sensor scan? The attached clip shows some issues of the setup: the 595 has source and sink limitations and the shared resistors in the common cathode aren't helpful either to mitigate that floating current: 1s are displayed much brighter, because there are only two segments on (8 LEDs for a '1' vs. 20 for a '2'). Since most of the characters/digits consist of more than just (1) or 2 segments, it is not that big a deal... but it is clearly noticeable... What is also noticeable is that flickering is setting in: the (theoretical) scan rate as currently (re)set to 100 times a second (10ms) seems not happening all the times anymore. From the flicker I conclude that the 'intervalled' function that does the display buffer change is already interfering with the scan interval. That looks great! Shame about the bleeding/duty cycle... I'm always amazed at how much brighter modern LEDs are than the older ones - I guess it makes it much easier to work with lower duty cycles. If you needed to get it faster you could actually try unrolling your while loop? It's only 11 iterations?